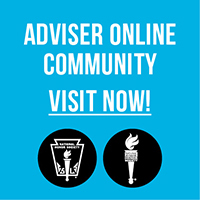 The chapter adviser provides a wealth of advice and practical knowledge and is one of the most important factors in the success of an Honor Society chapter. The adviser is the liaison between students and school administration. Advising requires personal time and educational commitment. Be sure your current practices are in line with what’s written in your bylaws and that the bylaws are in line with the provisions of the NJHS National Constitution. If they don’t coincide, reconcile the differences.